World number ones Amr Shabana and Nicol David kept their unexpected opponents at bay in the finals of the Cathay Pacific Swiss Privilege Hong Kong Open Squash Championships at the Hollywood Plaza to repeat the successes they both enjoyed at the same location last December when Hong Kong hosted the World Open Championships. Malaysian star Nicol David, the women's event favourite, reached the final after a tough five-game semi-final battle with Australian rival Rachael Grinham – while England's seventh seed Tania Bailey arrived at the climax after creating upsets over second seed Vanessa Atkinson and fifth seed Vicky Botwright, but without dropping a game in the event so far. David, the reigning world champion with 21 successive WISPA World Tour wins behind her, swept to a convincing first game win and, after being extended to eight-all in the second, recovered her authority to clinch the match 9-1, 10-8, 9-5 after 41 minutes to claim her fifth WISPA title in a row, and the 15th of her career. "I made a good start, but if you gave Tania any room she'll take advantage, which is what she did in the second," explained the 23-year-old from Penang afterwards. "I thought I played a good match, felt really good and with a good rhythm, I just pushed on to the end of the match." Bailey, showing signs that she has finally overcome the injury and illness woes which have disrupted her career since her career-high world No3 ranking in March 2003, was celebrating her first ever appearance in a WISPA Platinum event final. "I was a bit overmatched at the start, but managed to get into it in the second," said the 27-year-old British National champion from Stamford in Lincolnshire. "After I got to 8-1, I couldn't win the next point and after that she just didn't make any errors. She's done that to me a few times, but I did expect to win that game. At 2/0 down instead of one-all, you're definitely up against it! "Her pace is so much more than the other girls and she takes everything so early. But it's great to come through five matches - that's a big bonus, and I've got lots of good things to take back with me." Shabana also had a battle on his hands in the men's semi-finals, twice needing to come from behind before beating England's fourth seed James Willstrop in a 76-minute five-game clash. His opponent, however, arrived on an almighty high: Unseeded, 19-year-old Ramy Ashour despatched world No10 John White; world No3 Thierry Lincou; world No23 Peter Barker and then world No2 David Palmer, the world champion from Australia, in successive rounds to reach the first Super Series final of his brief career to date. Ashour, who only three months ago made history by becoming the first player to win the world junior men's title for the second time, was far from overawed by Shabana, his Egyptian compatriot. The teenager led 7-3 in the first game, but Shabana came back to take the opener before Ashour clinched the second to draw level. It was Shabana who had the upper hand in the third, but Ashour was unable to convert two game balls in the fourth before the favourite finally claimed victory 11-10 (3-1), 3-11, 11-5, 11-10 (3-1) after 48 minutes. "It was such a close match, like you saw in the third, just one point in it," said Shabana afterwards. "It was attacking squash, but that's how we're taught to play back home, it's the only way we know to do it. "It's the first time two Egyptians have been in a Super Series final, we're proud of that and we're glad we put on a good show," added the new Hong Kong Open champion. "Ramy is only just 19, world junior champion - but we can't think of him as a junior anymore - and he has a great future in the game, a future world champion, for sure." A tired, but elated, Ashour said: "I lost to the world number one, I played well throughout the tournament, and I'm happy for Amr that he will still be number one, it's a great honour for our country. "After week like this, I'm so tired." World Ranked No. 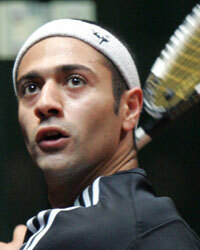 1 Egypt's Amr Shabana is top seed in Hong Kong and will meet Egyptian Ramy Ashour in the Final. World number ones Amr Shabana and Nicol David reached the finals the Cathay Pacific Swiss Privilege Hong Kong Open Squash Championships at the Hollywood Plaza as predicted by the seedings, but their opponents caused major surprises to join them – unseeded Egyptian teenager Ramy Ashour continuing his genuinely 'giant-killing' run in the event to beat Australia's second seed David Palmer and seventh seed Tania Bailey despatching her higher-ranked English compatriot Vicky Botwright in the women's semi-finals. With each shock victory in the men's PSA Super Series Platinum event, Ashour has collected a bigger scalp. And his four-game victory over Palmer, the world No2, neatly sets up the 19-year-old from Cairo with a chance at the ultimate prize – the world number one! Ashour was in rampant form as he dismissed Palmer 7-11, 11-8, 11-8, 11-3 – a 55-minute victory by the world junior champion over his senior equivalent. "I can't express my feelings, I'm so happy. 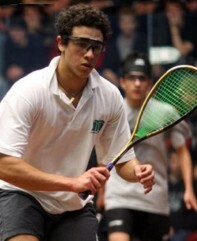 He's a great payer and to beat him is fantastic," Ashour said afterwards. "I had a feeling I could do well in this tournament – not winning it or even getting to the final – but to do that is just unbelievable. "Now I have to play my hero, friend and mentor, Amr Shabana," added Ashour on the eve of his maiden Super Series final. Shabana twice had to come from behind to defeat England 's James Willstrop, the No4 seed, in the other semi. The two-times world champion ultimately prevailed 9-11, 11-8, 9-11, 11-6, 11-9 in 76 minutes to reach his 18th PSA Tour final – and his fourth this year. Tania Bailey swept to a 9-1, 9-7, 9-7 victory in 57 minutes over fifth seed Botwright – to reach the biggest final of her career while becoming the only player in the women's WISPA Platinum event to prevail without dropping a game. The win is the latest affirmation that Bailey has finally overcome the long period of injury and illness which disrupted her career since achieving her career-high world No3 ranking in March 2003. “I have reached a Gold standard final before but this is the first time I have ever reached the final of a Platinum standard event,” Bailey told www.squashnow.com. “Perhaps, more importantly, I cannot remember the last time I had to play five matches back-to-back in a tournament and I am coming up for each one in good shape." The 27-year-old British National champion from Lincolnshire will now face Nicol David, the Malaysian world champion who was given her toughest test in the event so far before beating rival Rachael Grinham, the No3 seed from Australia, 2-9, 9-6, 6-9, 9-5, 9-1 in 61 minutes. It was the pair's sixth WISPA meeting this year, but marked David's 21st successive match win on the Tour. Victory in the Hong Kong final would gave the 23-year-old from Penang her fifth successive WISPA title. Breakthrough triumphs by England team-mates Tania Bailey and Vicky Botwright in the women's event will ensure an English player in the final of the WISPA Platinum championship. After sensational earlier upsets over world No10 John White and world No3 Thierry Lincou, this was the first time that Ashour, the 19-year-old double world junior champion from Cairo , faced a player ranked below him. And Barker, the world No23 from England , shocked the newly-promoted world No13 by taking the first game and forcing the second into a tie-break. But the in-form Ashour fought back to secure the match 6-11, 11-10 (2-0), 11-10 (3-1), 11-5 in 55 minutes to set up a clash with David Palmer, the No2 seed from Australia who needed 76 minutes to defeat fellow countryman Stewart Boswell, the 12th seed, 11-10 (3-1), 11-8, 9-11, 8-11, 11-3. James Willstrop avenged two recent defeats by Egypt 's Karim Darwish to beat the world No11 11-7, 11-5, 11-4 in 39 minutes. The fourth seed from England will now take on top seed Amr Shabana, the world No1 from Egypt who overcame Gregory Gaultier after the Frenchman retired injured with the score standing at 11-10 (2-0), 11-2. Australia's fourth seed Natalie Grinham, the three-times gold medallist in the Commonwealth Games earlier in the year, 0-9, 9-3, 9-1, 9-5 in 34 minutes. The 29-year-old fifth seed from Manchester will meet compatriot Bailey in the semis for only the second time ever on the WISPA World Tour. Bailey, the No7 seed, recorded the latest upset in her long-drawn-out comeback trail from injury by beating second seed Vanessa Atkinson, from the Netherlands , 9-5, 9-1, 9-5. By contrast, the other semi-final will mark the sixth Tour meeting this year between Malaysia 's Nicol David and Australian Rachael Grinham. David, the top seed looking for a second successive win in Hong Kong - the scene of her World Open triumph last year – battled for 35 minutes to quash Irish No1 Madeline Perry, the No8 seed, 9-4, 10-8, 9-2. Third seed Grinham, needed 52 minutes to dismiss Egypt 's Omneya Abdel Kawy 9-5, 7-9, 9-0, 9-3. Proving in sensational style that his first round upset of tenth seed John White was no fluke, unseeded Egyptian teenager Ramy Ashour despatched France's No3 seed Thierry Lincou in the second round of the Cathay Pacific Swiss Privilege Hong Kong Open Squash Championships to record the best result of his brief career to date. Since in July becoming the first man in history to become the world junior champion twice, Ashour has made rapid on the senior circuit – leaping eight places to a career-high world No13 ranking this month. But the 19-year-old's 61-minute dismissal of Lincou, the world No3, in an 11-8, 2-11, 11-7, 11-10 (5-3) scoreline, marks Ashour's first top five scalp. The defeat for Lincou, one of the most consistent players on the PSA Tour, ends a remarkable 30-event Super Series run since March 2002 in which he has reached at least the quarter-finals! Ashour now faces another unseeded player after Peter Barker recorded his first ever win over senior England team-mate Lee Beachill. Barker, the 23-year-old world No23 from Essex, beat the eighth seed 11-9, 11-10 (2-0), 11-7 in 47 minutes to earn his first appearance in a Super Series quarter-final. Australia's 12th seed Stewart Boswell also pulled off a notable upset. Fresh from his title success in last month's St Louis Open in the USA, the 28-year-old from Canberra removed England's British Open champion Nick Matthew, the seventh seed, 9-11, 11-3, 11-7, 9-11, 11-9 in 78 minutes. Boswell now faces compatriot David Palmer, the No2 seed, for a place in the last four. One of the bravest performances in the men's event was displayed by England's 16th seed Adrian Grant. The left-hander from London fought back from 2/0 down against Gregory Gaultier to draw level with the rising star from France. But, despite an injury break which took the players off court for almost an hour, sixth seed Gaultier was finally able to clinch an 11-10 (2-0), 11-3, 3-11, 7-11, 11-10 (3-1) victory some 146 minutes after the match started! Malaysia's Nicol David claimed the fastest route into the last eight in the women's event. The top-seeded world No1 despatched Dutch training partner Annelize Naude 9-2, 9-3, 9-0 in just 18 minutes as she set her sights on reaching Sunday's final in a bid to repeat her success in Hong Kong last December when she became World Open champion for the first time. David will now face Ireland's eighth seed Madeline Perry, who claimed a convincing 9-2, 9-0, 9-3 win over England's Dominique Lloyd-Walter to reach the quarter-finals. Egypt's Omneya Abdel Kawy secured the only upset in the women's event. The No9 seed beat England's sixth seed Jenny Duncalf 9-3, 9-5, 9-5 in 40 minutes – and will now face Egypt-based Rachael Grinham, the third seed from Australia who was extended for 83 minutes by fast-rising young Egyptian Engy Kheirallah before winning 4-9, 9-2, 9-6, 6-9, 9-2. Upsets produced by lower-ranked English and Egyptian players characterised today's opening day's play in the men's event in the Cathay Pacific Swiss Privilege Hong Kong Open Squash Championships at the Hong Kong Squash Centre. It was a black day for the two Malaysian men who share the world No16 ranking. Mohd Azlan Iskandar, the 11th seed who arrived in Hong Kong fresh from an unexpected final berth in last week's Village Open in New York, failed to capitalise on a 2/1 lead over English qualifier Alister Walker – and, after losing a tie-break in the fourth game, went down 11-7, 10-11 (7-9), 8-11, 11-10 (4-2), 11-5 in a 96-minute marathon which was by far the longest battle of the day. Walker, the Botswana-born world No44 from Leeds in Yorkshire – and the only qualifier to reach the last 16 - now goes on to meet county compatriot James Willstrop, the No4 seed who had to work hard to overcome Wales's British Open Over-35 champion Alex Gough 11-10 (4-2), 11-10 (2-0), 11-4. Ong Beng Hee, who like fellow Malaysian Azlan Iskandar had been enjoying a good run of recent form, was also taken to task by a lower-ranked Englishman. Left-hander Peter Barker, the 23-year-old from Essex who made his England debut this year, beat 13th seed Beng Hee 11-8, 10-11 (0-2), 11-8, 11-7 in 74 minutes – and will now also meet a Yorkshireman, Lee Beachill, in the next round. Beachill, the No8 seed, defeated Canadian Shahier Razik 11-6, 9-11, 11-9, 11-6. Scotland's John White was the highest seed to fall. Just nine months after beating Egypt's Ramy Ashour in straight games in the final of the Dayton Open in the USA, tenth seed White crashed out to the teenager 11-9, 11-9, 11-8 in just 34 minutes. Ashour, the 19-year-old from Cairo who won a record second world junior title earlier this year, will join Mohammed Abbas in the second round after his unseeded compatriot upset Finland's 14th seed Olli Tuominen 11-4, 11-7, 11-6. There was Malaysian success in the women's event when favourite Nicol David crushed Australia's Melissa Martin 9-0, 9-3, 9-1 in just 20 minutes. David, the world No1 who has returned to the scene of her World Open title success last December, will now meet one of her Dutch training partners Annelize Naude for a place in the quarter-finals. Naude, the 15th seed, beat New Zealand qualifier Louise Crome 9-7, 9-6, 9-2. Vanessa Atkinson, the No2 seed from the Netherlands whom Nicol David is expected to meet in Sunday's final, made a hesitant start in a bid for her first WISPA World Tour success since March. The world No2 needed 40 minutes to despatch English qualifier Rebecca Botwright 9-1, 5-9, 9-5, 9-6 – and will now meet another Lancastrian, 11th seed Laura-Jane Lengthorn, who beat compatriot Lauren Briggs 9-1, 10-9, 4-9, 9-3 in 55 minutes. Dramatic fight-backs in today's (Tuesday) qualifying finals for places in the main draw of the Cathay Pacific Swiss Privilege Hong Kong Open Squash Championships provided mixed fortunes for India's top two PSA Tour players at the Hong Kong Squash Centre. Indian national champion Saurav Ghosal, the world No 54 from Chennai, took a two-game lead against Daryl Selby and had two match balls in the third game. But the Englishman, ranked four places higher, kept his focus and clinched the game 5-3 on the tie-break, then maintained the upper hand throughout the remainder of the match to record a stunning 10-11 (1-3), 8-11, 11-10 (5-3), 11-6, 11-5 victory in 70 minutes. Ritwik Bhattacharya faced defeat when Australia's Aaron Frankcomb forged a 2/0 lead. But the 27-year-old from New Delhi came back to win 9-11, 4-11, 11-8, 11-4, 11-4. While Selby goes through to meet France's sixth seed Gregory Gaultier, Bhattacharya takes on Egyptian Karim Darwish, the No9 seed. Pakistan celebrated double success in the qualifiers with both Mansoor Zaman and Aamir Atlas Khan earning places in the main draw of the men's $120,000 Super Series Platinum event. Khan, 16, from Peshawar, ended Omar Elborolossy's comeback run - beating the retired Egyptian, who is almost twice his age, 11-7, 6-11, 11-7, 11-9 in 39 minutes. While the teenager takes on England's British Open champion Nick Matthew, the No7 seed, Zaman will face 15th seed Wael El Hindi after despatching England's Tom Richards 11-6, 11-9, 11-7. English interest in the $87,500 WISPA Platinum championship was boosted by a further two players when Suzie Pierrepont and Rebecca Botwright came through the qualifying finals. Botwright beat Australia's Rachel Smith 9-5, 9-0, 9-6, while Pierrepont was the cause of one of the three women's Hong Kong casualties on the day, defeating Annie Au 9-1, 9-6, 9-4.